It's a fact that for a runner, first half marathon and marathon will forever be imprinted in the mind. Today was my first official half marathon and I experienced this fact myself. It was gratifying as well as strenuous, unexpectedly humorous and inspirational at the same time. I felt the overwhelming joy of reaching 13.1 miles without stopping for a second. Clearly, I was not the best runner in the lot but sensed the universal pride that comes from accomplishing the first half marathon. I am thrilled to narrate the short story of this eventful day for blog readers and hopefully be able to spark an interest in those of you who aspire to be future marathon runners. The race was to start at 8:30am at downtown Houston’s historic Sam Houston Park. My daughter Navya and I started early in the morning so that we could be there at least 30 minutes before the race. My son had a sleepover last night in our house, so he could not come and neither could my wife. But, again they are going to get more opportunities in future for sure because I have many more races planned this year. 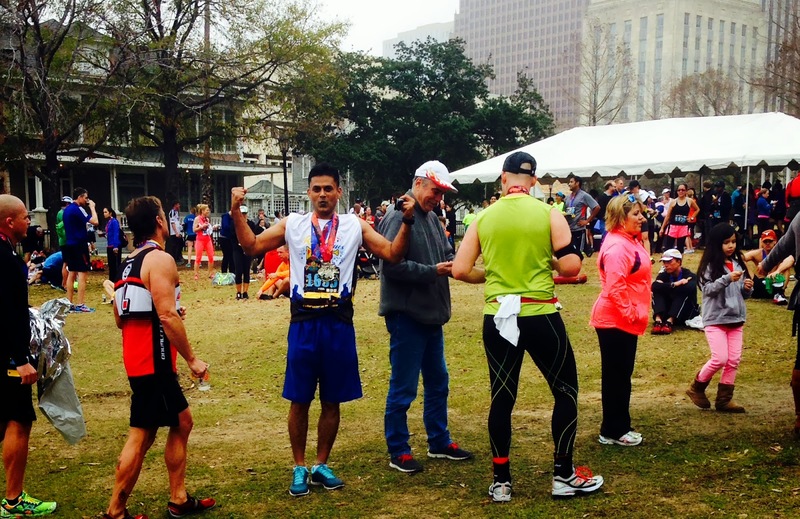 True to its name, “Houston Rhythm and Blues Half Marathon”, the atmosphere was electrifying. We were told by the organizers that 15-16 selected Rhythm and Blues bands from throughout Texas would be playing throughout the running course to cheer up all the runners. I did not realize at that moment how that positive encouragement could help motivate me straight to the finish line. run. I truly believed that and tried to heed to their advice. That being said, I had this target of finishing the race within 2 hours in my mind. I was going at my own comfortable pace which I used to maintain during my practice runs. I was not trying to run very fast yet maintained my goal speed each mile. At the first water station after 2 miles, a few runners took a sip of Gatorade or water; I decided to run continuously instead. During practice runs too, I seldom drank any water so I adhered to that self-imposed rule. First six miles passed by without any fuss, racing to the beats of live bands along a spectator filled course. I was happy with my performance so far because my body was coping up well and was handsomely cruising along towards my goal of finishing the race well below two hours. Exactly then I noticed the change in the elevation of the course which brought my speed down a little. It was a deterrent but could not dampen my spirits to finish the race in two hours (2:01:43:4 to be exact). For my last mile, I had a plan to run it in 8 minutes which I did overtaking quite a few runners just before the finish line. The overall feeling of crossing that line and finishing the race is difficult to put into words. It’s an adrenaline rush like no other. And then the post run FUN begins. After having a few pictures taken first by my daughter who was visibly very excited that her dad did it and then by the professional photographer, we moved to the staged area where a popular Texan band was playing mainstream music. When I looked at different booths for food, drink and fitness related advertisements, I noticed one line to be the longest. To my pleasant surprise, that was the beer line for the runners and I also joined that crowd for a mug of draught beer. There were people dancing and singing along with the band while some of them still eagerly waiting for their dear ones to complete the race. We stayed there for one hour or so then decided to head out home after enjoying a memorable day at an amazing race! WoW!! This is awesome! Couldn't even imagine running so far for so long!! You can do that. Anybody can. It's not that hard. Set up a goal in my mind and go for it. I know it sounds difficult but trust me - once you cross the initial stages of frustration and pain ( the threshold), you will reach a blissful state of motion. And then everything will be easy and comfortable. Just think positive about what can you accomplish if you surmount the fear and psychological barrier. Well done man! Great job..Congrats once again! Your words are always encouraging. Congratulations on this achievement. I am sure you will accomplish the full marathon without any trouble. I know you are an avid jogger with several years of exp. please share your experience with our group to motivate us. a great achievement! yes, you can register for a full distance marathon and start training towards it, you will cruise through easily.. congratulations once again! Yes, I will register. However, I would like to run couple of more official half-marathons in next 2-3 months under 2 hours consistently before going for the final quest.